The Greatest Western Writer Of The 21st Century On the rolling Missouri River a riverboat of fur traders, a U.S. Senator and Prussian royalty are all heading to the Yellowstone from St. Louis. Preacher's onboard because the nation's fate depends on the passengers landing safe and sound. But it won't be easy. Two beautiful women make a play for Preacher. So does a killer. So does a band of river pirates. 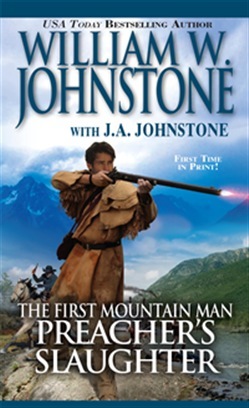 No sooner does Preacher beat back these threats than the riverboat lands in the middle of a blood-soaked Indian ambush--with a Prussian nobleman and his family taken hostage. Preacher has no choice but to go off in pursuit, even with a traitor trying to slaughter him. Someone wants to start a war and change the course of American history. Only a lone mountain man and the ambush of bullets he wields with deadly, unerring force stands in the way. . .
Acquista Preacher's Slaughter in Epub: dopo aver letto l’ebook Preacher's Slaughter di J.A. Johnstone, William W. Johnstone ti invitiamo a lasciarci una Recensione qui sotto: sarà utile agli utenti che non abbiano ancora letto questo libro e che vogliano avere delle opinioni altrui. L’opinione su di un libro è molto soggettiva e per questo leggere eventuali recensioni negative non ci dovrà frenare dall’acquisto, anzi dovrà spingerci ad acquistare il libro in fretta per poter dire la nostra ed eventualmente smentire quanto commentato da altri, contribuendo ad arricchire più possibile i commenti e dare sempre più spunti di confronto al pubblico online.